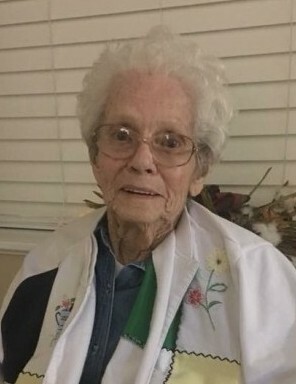 Wilma Beatrice "Aunt Bea" Bearden Headley, age 88 of Clanton, passed away peacefully on October 17, 2018 at Hatley Healthcare in Clanton. She was born on August 4, 1930, daughter of the late Charlie Bearden and the late Mary "Dee" Frith Bearden. She is survived by Nieces and Nephews, Ann (James) Latham of Maplesville, Mike (Pam) Bearden of Maplesville, Ceaborn Oden of Maplesville, Van (Joyce) Headley of Clanton, Pam (Jo) Teel of Clanton, and Ken (Lynn) Headley of Hoover; Brother-in-laws and Sister-in-laws, Sara Nell Oden of Maplesville, EJ (Pat) Headley of Clanton, Huey (Linda) Headley of Clanton, Carl Hayes of Clanton, Nell Headley of Calera, and Margaretha Headley of Columbiana; and Special Friends, Kathy Smith of Jemison, Paula Josephs of Clanton, and Louise Lenoir of Selma. She is preceded in death by her husband, Walter "Shorty" Headley, and her parents, Charlie and Mary "Dee" Bearden. Graveside services will be held on Friday, October 19, 2018 at 2:30 pm at the Sardis Baptist Church Cemetery in Maplesville with Bro. Van Headley officiating. The family will receive friends on Friday from 1:00 - 2:00 pm at the funeral home. The family would also like to extend a special thanks to wonderful care given by Hatley's staff and also the staff of Alacare Hospice during this time.